Chef inspired tastes of the South with a twist that will delight your senses at The Company Supply restaurant in Dublin! I have relatives in the area and they have been raving about The Company Supply on Jackson Street, so we traveled to Dublin from Macon to check out what all the hub-bub was about and it sure didn’t disappoint! First, the owners restored a 120 year old dry goods store and re-purposed much of the wood throughout the establishment. Even the fixtures and décor are original pieces of the former store giving it a real rustic yet modern look. As for the food, I was told you can’t go wrong with any item on the menu, so for me, it was the pulled chicken plate because I was told it just melts in your mouth. That it did!! You talk about good. They did all the work in pulling the chicken off the bone, so all I had to do was just dig in. The meat was so tender and the flavor was magnificent! My two sides were the mashed sweet potatoes and garlic green beans, both absolutely delicious. Other dishes tried were the Shrimp Po Boy and Shrimp Etouffee. To top off the evening, we partook in some sweet treats, the bourbon pecan pie and chocolate cake. Mmm, mmm good!! 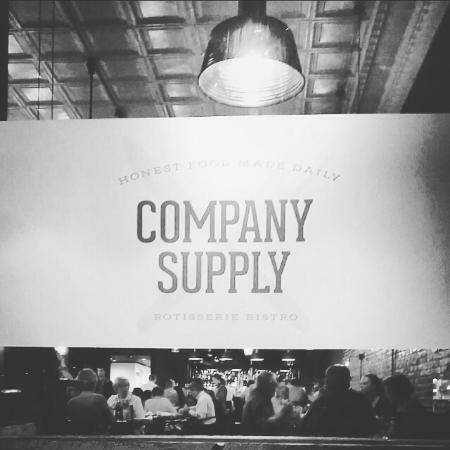 Dine at the Company Supply yourself and experience what all the fuss is about!